In a land once ruled over by a fierce mythical matriarch, marine animals cavort and relax in UNESCO-protected bliss. 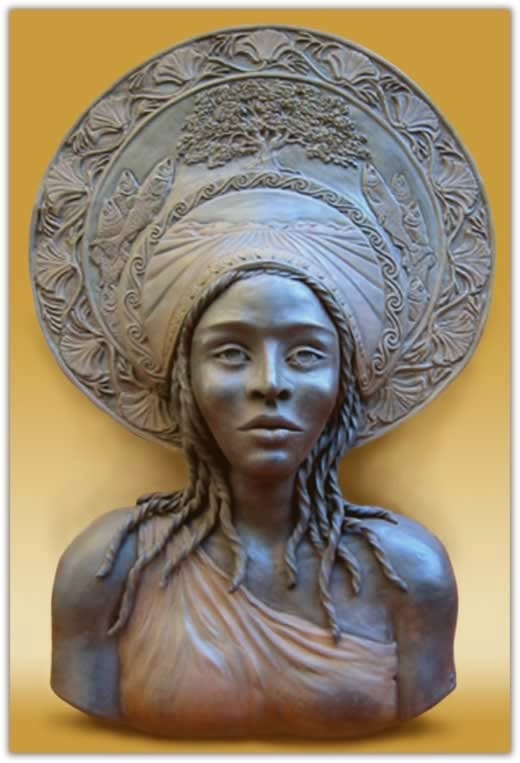 The island in de Montalvo’s description was ruled by Califia, a magnificent negress by all accounts. Her domain, like the Amazons, was a matriarchal dominion where the few men were subjugated and enslaved by these all-conquering women. When it suited her, Califia would muster her troops and raid the neighbouring lands, seizing men and territory. Her warriors wore armour of gold and rode fierce steeds with barding that shone like the sun. Some researchers are convinced a fearsome black queen of either African or Polynesian origin once existed on these shores, and de Montalvo, like Shakespeare, had adapted legend and lore for his own purposes. The Spanish novelist, a contemporary of Christopher Columbus whose lurid prose described these lands in great detail, was sufficiently convincing for the Mexican Governor, Hernán Cortés, to send ships in search of this land of plenty. Like so many Spanish follies of the time, they ended in disaster for the explorers and all those they encountered. The island of California, however, persisted on maps for more than 100 years and wasn’t conclusively disproved by land explorers until almost the 19th century. Today this giant spur-like peninsula, the second largest in the world, is part of Mexico and called Baja California. It is divided into two ‘free and sovereign states’; Baja California and Baja California Sur (south). The 160,000km2 Gulf of California enclosed by the peninsula is also known by its alternative moniker, The Sea of Cortés (or Cortez). At the very tip is the resort town of Cabo San Lucas (Cape Saint Luke), which has grown progressively from a grubby mining village and tuna cannery at the turn of the last century to one of Mexico’s premier tourist locations and aquatic playgrounds. Massive ships from Holland America, Carnival, Celebrity and Princess regularly call in to the region more commonly known in cruise circles as the ‘Mexican Riviera’ and which extends as far as Acapulco. Much of the credit for this popular acceleration is due to the Nobel and Pulitzer prize-winning author, John Steinbeck, whose account of a marine biology expedition in 1940 with his biologist friend, Ed Ricketts, spawned the 288-page non-fiction book ‘The Log from the Sea of Cortez’, published in 1950. Steinbeck describes this lost world as “ferocious with life”, often citing his fear of man’s potential for destruction through urban development and careless fishing techniques. Even as the pair travelled, a hotel was being built along with the airport and railway. And develop it did. Cabo San Lucas quickly became the playground for Hollywood A-Listers and celebrities like John Wayne, Chuck Connors, Desi Arnez, Lucille Ball, Bing Crosby, Jacques Cousteau and Ernest Hemingway who enjoyed the incredible fishing and balmy lifestyle. Cousteau, who visited some 35 years ago was, predictably enough, more interested in what dwelled below the surface and coined the tagline “the world’s aquarium”, often re-used by the new wave of adventure cruise operators probing much further north than any of the floating behemoths visiting Cabo San Lucas. The undisputed leader in this field is Lindblad Expeditions who have been exploring the ‘Sea of Cortez’ since Cousteau’s time. In 1977, a young Sven Lindblad was travelling from Argentina to Mexico on his late father’s ship, the MS Lindblad Expolorer. They had a few days to spare and decided to call in to the Gulf of California to explore. Lindblad began commercial voyages in 1981 and has continued that tradition unbroken for more than 30 years. During that time UNESCO bestowed World Heritage status on the region, stating the “diversity of terrestrial and marine life is extraordinary and constitutes a unique ecoregion of high priority for biodiversity conservation”. 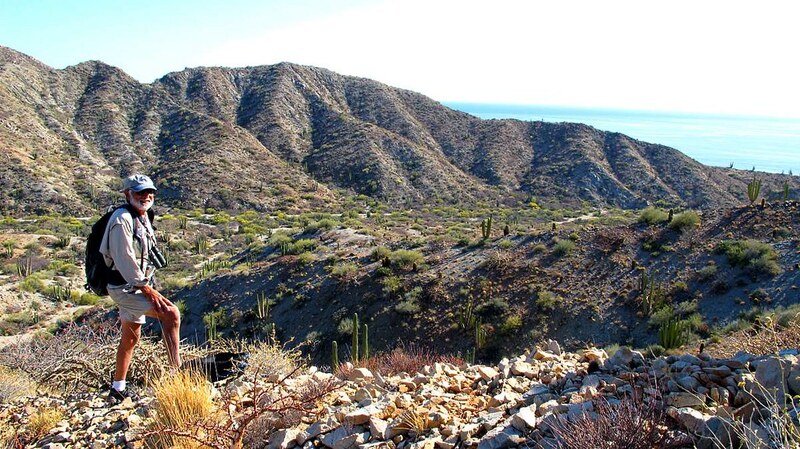 For the last decade the Gulf of California has enjoyed this cherished protection. Today two of the company’s 62-passenger vessels operate side-by-side on itineraries of either one or two weeks’ duration, plunging guests into an experience that includes observation and encounters with all manner of whales, sea lions, marine birds and land reptiles. 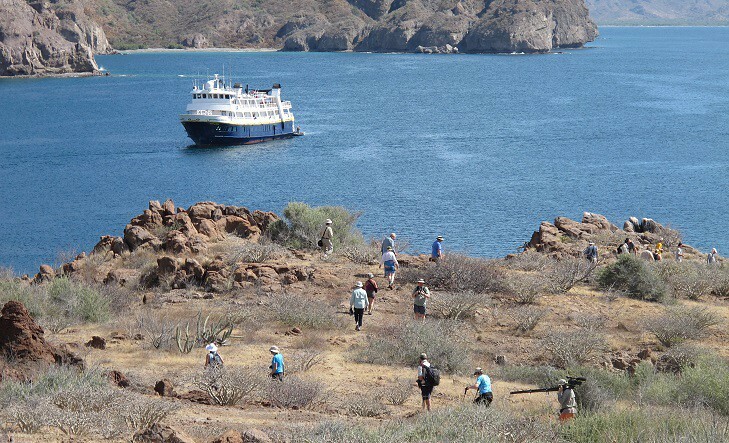 I’m aboard the late season ‘Spring in the Sea of Cortez’, a mid-April itinerary that probes deep into the gulf as far as Isla San Esteban. For a full week, we explore the inside leg of the Gulf of California, going ashore for nature hikes, early morning yoga, town visits, snorkelling in the coves, photography classes as well as kayaking along the craggy shores. Despite numerous sightings of sperm whales, pilot whales, dolphins and porpoises of various types and more seabirds than I could ever tick off, the signature gray whale encounters are not to be had at this time of the year. These famously gregarious and interactive mammals are en route to Alaska by now from their breeding ground at Bahía Magdalena on the western coast. Nevertheless, our expedition team of naturalists are unrelenting in their enthusiasm and desire to share and impart their vast knowledge and in this respect, I place the Lindblad Expeditions-National Geographic crew consistently among the very best in this arena. Our ship, the National Geographic Sea Lion, is cosy, comfortable and unpretentious. While it’s ideal for the destination, cruise snobs would remark on the compact cabins and lack of lavish accoutrements. Dining is straightforward in single sittings at unreserved tables, ideal for rotating among fellow passengers and getting to know everyone. While I am the only Australian on board and travelling solo, I find the varied company stimulating and welcoming. Exactly as I remember Alaska aboard the twin, NG Sea Bird last year. Exploring and discovering with Lindblad Expeditions - National Geographic is not a ‘cruise’ in the popular sense, it’s adventure and enrichment at sea and none of my fellow travellers lament the lack of big ship, mass market niceties. Dedicated to imparting knowledge and in a spirit of conservation, I’m certain even the feared Queen Califia herself would welcome us into her domain. This article originally published in The Daily Telegraph and Courier Mail.